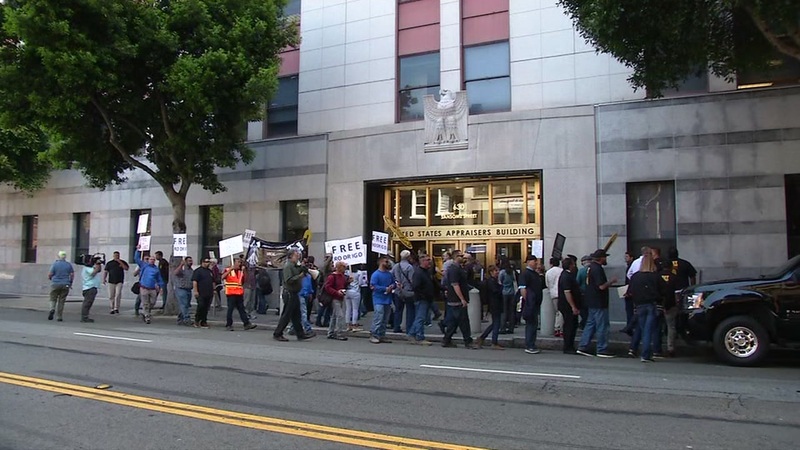 SAN FRANCISCO (KGO) -- Seven people are facing federal trespassing charges for staging a protest inside San Francisco's immigration building. Video taken inside the building by one of the demonstrators before they were arrested, shows them demanding the release of two construction workers detained a month ago at Travis Air Force Base. Outside the immigration office, coworkers and supporters of Hugo Mejia" and Rodrigo Nunez protested their detention. On Monday, their lawyer filed a motion to keep stay their deportation. "ICE would just allow them to stay here despite them not having any sort of lawful status in the country. And, they would be freed from the detention facility, but they wouldn't have any path to citizenship," explained Alisa Whitfield with Centro Legal de la Raza. Neither of the construction workers is eligible to plead their case before a judge because they were deported 15 years ago, but came back to the United States. Click here to read more stories on immigration.